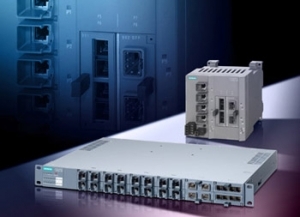 The Siemens Division Industry Automation is offering three of its Industrial Ethernet switches with PoE (Power over Ethernet) functionality in accordance with IEEE 802.3af. Depending on the scope and requirements of the application, the X108PoE unmanaged switch and the X308-2M PoE and XR324-4M PoE modular managed switches supply two, four or eight PoE-compatible terminal devices with data and power on a common line. Suitable terminal devices are IP telephones, scanning systems, access points and IP cameras, for example. This not only helps to save on installation costs but also eliminates the need for an additional power supply in many applications. Integrated within the new switches is a power supply in accordance with IEEE 802.3af for data and power supply of the terminal devices. Ethernet standard IEEE 802.3af, which defines the voltage supply of PoE-compatible devices connected to Ethernet, offers new fields of application in industrial automation beyond mere communications between automation devices. In the case of video surveillance, until now almost exclusively the domain of building automation, the new PoE switches integrate the connected cameras into automation applications. Application scenarios could include the monitoring of storage and retrieval units, or for operators in processing plants with increased safety for personnel and machinery and enhanced process quality.